After installing several layers of rigid foam above the roof sheathing, these workers installed plywood above the rigid foam. The plywood was fastened through the rigid foam to the rafters with long screws. UPDATED on December 15, 2017 with information on the U-factor alternative. A roof over a vented, unconditioned attic does not need to include any insulation. However, most cathedral ceilings and low-slope (flat) roofs are insulated roof assemblies: with this kind of roof, the insulation follows the slope of the roof. Insulated roof assemblies can be vented or unvented. There are lots of different ways to insulate this type of roof, but one of the best methods calls for the installation of rigid foam insulation above the roof sheathing. How much foam do I need? Great article, thanks Martin. Will be using the un-"vented-over" method when we build our addition, probably with the EPS buffered polyiso option for the foam. Have you ever heard of someone installing 2x4s over the first half of the foam, parallel to the rafters, with 1.5" foamboard between the 2x4s to fill the gap, then installing the rest of the foam over top? Seems like you could avoid a lot of the frustration associated with using 10" screws. Plus, the tiny thermal penalty would be more than overcome by avoiding metal fasteners traveling directly through the assembly. Do you see any drawbacks wiyh this method? Does it seem impractical? Yes, I've heard of the method you describe. You'll end up with a roof assembly that isn't quite as well insulated as it would have been without the 2x4s in the middle of the sandwich. But in some cases, ease of installation may trump performance. The decision is yours. The amount of exterior-R needs to rise above the IRC prescripitive minimums if the total-R is going to be above code min. The whole point of the prescriptive minimum is to keep the average temperature of the roof deck sufficiently above the average wintertime dew point of the conditioned space air that it doesn't accumulate too much moisture. If you increase the interior-side R value such that the total R goes higher than code min, you MUST raise the exterior-side R proportionally or the roof deck will run colder. On another note, regarding the derating of polyiso for temperature it's the average temperature through the foam, and not the exterior temperature that is the relevant parameter. At an average temp through the foam of 25F the performance drops below R4, true. But if polyiso is the only insulation and the interior is kept at 70F and the exterior temp is 25F, the average temp through the foam is 47.5, or about +9C. Looking at Karagiozis' curve (https://www.greenbuildingadvisor.com/sites/default/files/Karagiozis%20-%20thermal%20conductivity%20of%20a%20variety%20of%20insulations%20as%20a%20function%20of%20mean%20temperature.jpg ), at +9C the performance of polyiso at a mean temp of +9C is comparable to that of XPS at +9C. The performance of XPS at a mean temperature of +9C/47.5F is substantially above it's R5/inch labeled performance, which is tested at a mean foam temp of 75F, with the cold side at 60F, the hot side at 90F. So, in the all-polyiso insulation stackup when the outdoor temp is +25F, the performance is still well above R5/inch, which is still pretty good. But in the climate zone 5 prescriptive-mininum situation with R29 on the interior, R20 polyiso on the exterior, the warm side of the polyiso is colder than 70F. At an interior temp of 70F and an outdoor temp of 25F, the roof deck is colder, about 40% of the temperature difference above the outdoor temp, or about 43F. With an outdoor temp of 25F and roof deck temp of ~43F the mean temp through the foam is now about 34F/1C. Looking at Karagiosis' derating curve the performance of polyiso at a mean temp of 1C is about half that of XPS at 1C, which. The performance of XPS at +1C is no better than R5.5/inch, which means that in a 40% of labeled R on the exterior stackup the performance of the polyiso is LESS THAN R2.8 / inch, not R4.0inch (!). What this means for the average roof deck temp is complex, since during the warmer part of an average winter day in climate zone 5 the performance is substantially higher than during the coldest part of the day, but still performing at less than the labeled-R. But during the shoulder seasons it will perform substantially BETTER than it's labeled R as the mean-temp through the foam crosses through the +15C knee in Karagiozis' curve, which means the roof deck can dry faster. To compensate for the plummeting performance of polyiso in those stackups it's useful to split the thickness using equal thickness of EPS to polyiso, maintaining the prescriptive minimums. EPS performance rises in performance at low temps, and with EPS on the exterior it keeps the polyiso layer wamer, warm enough to improve it's average performance. In the zone 5/R20 case, 2" of EPS (R8) and 2" of polyiso (R12) would meet the prescriptive minimum. But now rather than having a mean temp of 34F through the polyiso when it's +25F out it will be running about 38F/+3C through that layer, and would be performing at about R4/inch, or R8 @ 2" , while the EPS would be running about R9, for a net performance of R17. A mean daily temp of +25F is pretty typical for a climate zone 5 location in January, but it's (usually) substantially higher in December & February, and the performance of polyiso will rise rapidly at those higher temperatures, reaching the peak performance knee in the curve in March in the 2" + 2" stackup. So even though the roof deck moisture accumulates faster in January than anticipated based on just the labeled R values, the drying season begins sooner, so it's still a moisture-safe and decent thermal performance stackup, a stackup that really will indeed average about R20 over the entire heating season. Of course going a bit higher than the prescriptive minimums gives you more moisture margin, but it's still worth splitting the thickness 50/50 with EPS to compensate for the derating curves. For an all-foam code-min solution that can be reduced to about 35 / 65 in climate zone 5 (4" of EPS + 5.5" polyiso) and it would meet or beat R49 throughout the season. Thanks for your very helpful comments. I have edited my article to reflect your points. Great article. If you refer to this article in QA answers will non-GBA prime members be able to read it? It's really good information. First time in 14 years I did not have ice dams! Live in zone 5 NH. 200 year colonial. 6. Second layer ice and water over that. Had 4 feet of snow on roof and did not sniff an ice dam. First time in 14 years. Great way to go if anyone is interested. Even with all this believe it or not the roof is lighter because I started by stripping 4 layers of shingles. Got to love old houses. I looked at the links in Lucy's comment (good links Lucy!) and was taken by an idea in the third one using SIPs on a roof. SIPs really are a good idea here because of the thickness and the nailer being included. The big disadvantage is that you don't need more than 1 layer and then it wouldn't be staggered, like two individual layers of foam would be. Here's an idea for the enterprising types. (Not me) Shouldn't there be a standardized type of SIP that is T&Ged on all 4 sides just like hardwood flooring? I'm not talking T&G on the nailers only but on the whole thickness of the SIP. If SIPs could be made like that in a standardized way it would eliminate all the fussiness in using 2 individual layers of foam. You have all the advantages of staggered seams by using that method, perhaps with some canned spray at the joints. If I am planning to install a standing seam metal roof, is it possible to attach it directly through the rigid foam? Or, if a top layer of plywood is necessary, what's the thinnest plywood that you'd recommend? Taunton Press has decided to put all my blogs (those written after late January 2015) behind the new paywall. These blogs can only be read by GBA Prime members. However, Taunton is still offering a 10-day free trial membership. Thanks for sharing your story. I'm glad that following this approach solved your ice dam problem. I'm confused by your reference to links in Lucy's comment -- which comment? which links? -- but my article does discuss the use of SIPs as one approach to adding rigid foam above the roof sheathing of an existing house. As far as I know, standing-seam metal roofing can't be installed on rigid foam; it has to be installed on plywood, OSB, or (possibly) purlins. If you want to be sure, talk to your roofer or the manufacturer of the roofing panels. I imagine that you could install it on 5/8" plywood, but of course 3/4" would be better. I wrote a response to Dirk Gently's question about installing foam on a roof. It's this post. That's where the links are. FastenMaster's HeadLok screws work great for screwing down 2xs or sheathing over thick foam. The washer-head style has good holding power and planes out flush without the need to overdrive and bury the hex head on many other screws. Thanks. I have edited the article to include your FastenMaster link, and the information on maximum length. Great information, Martin, as always! I am so happy to have found your advice through this website. What do you think? Any concerns? Thanks in advance! Yes, you can install through-fastened metal roofing to purlins. I would suggest 1x4s rather than 1x3s. You can install them 24 inches o.c., screwed through the foam to the rafters below. Of course, you still need solid sheathing (usually OSB or plywood) between the rafters and the rigid foam. 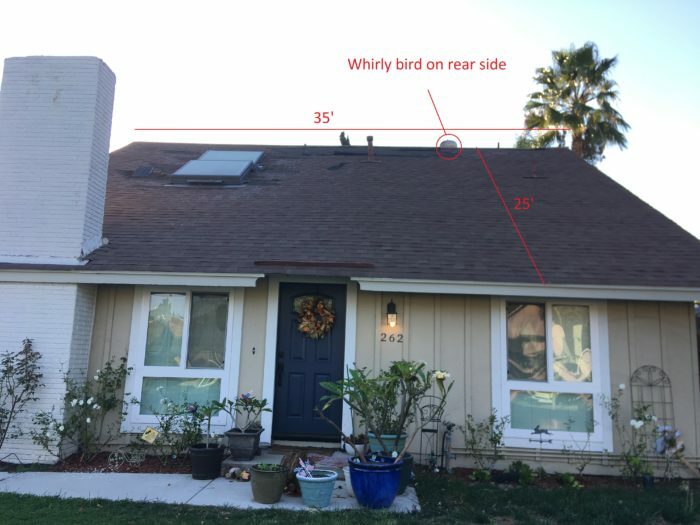 First, this article (and commentary) are incredibly thorough and very helpful as I am working with a customer interested in just such a roof retro-fit. If I can still get a question answered it is whether an interior air barrier is necessary on the inside of fibrous insulation under the roof deck when using the "Option 2" roof. It seems like it should be. Assuming it is, do you think dense-packing cellulose behind something like Mento-Plus would work. The house has vaulted and attic portions. Roof deck insulation is being chosen for continuity, the attic areas have limited accessibility, and cellulose will already be on site. To avoid getting into spray foam or having to get rigid material into the attic, I'm wondering if this is a possibility? It is always important to make sure that you know where your air barrier is, and to seal all leaks in your building envelope. Many builders establish the air barrier at the sheathing level. It is also possible to use well-taped rigid foam (above the roof sheathing) as your air barrier. Any air leaks at the eaves or ridge must be located and sealed. Once you've done this, a second air barrier under your fluffy insulation isn't strictly necessary -- but it certainly can't hurt. If you want to establish your primary air barrier on the interior side of the fluffy insulation rather than at the roof sheathing layer or rigid foam layer, that's certainly possible. Q. "Do you think dense-packing cellulose behind something like Mento-Plus would work?" A. I assume that Mento-Plus is an air barrier. Most installers of dense-packed cellulose use an air-permeable membrane like InsulWeb for dense-pack jobs. Because InsulWeb is air-permeable, it allows air to escape during the installation process. For more information, see How to Install Cellulose Insulation. I see your point about installation issues, duly noted. Although it still makes me nervous, I feel reasonably reassured that if an air barrier is established at the roof deck and an adequate percentage of R-value is outside of that, some air permeability of the fluffy stuff is acceptable. Besides it seems that an open cell foam installation wouldn't be much different than net and blown cellulose under these conditions. Climate Zone 4C Portland Oregon: I want to ensure that I have the right percentage of r-value above the roof deck relative to below the roof deck for dealing with condensation at the roof deck. In comments, Dana Dorsett commented particularly on this subject. She talks about the exterior side needing a minimum of 41% of the total r-value. What/where does this comes from and backup for this? The relevant code requirements are explained in the article on this page, as well as in How to Build an Insulated Cathedral Ceiling. In Climate Zone 4, the code requires at least R-10 of rigid foam above the roof sheathing for the type of roof assembly that you are contemplating. First, an heartfelt "thank you" to all the professionals on this site for the building science education I'm getting! I have a typical American Foursquare in zone 5. I just got a quote from a roofing company to tear-off the original cedar shake plus two layers of asphalt, install nailbase over the rafters, and then re-install the fascia and gutters, new asphalt shingles. The quote was $26k. Is that reasonable? My neighbor has the identical home next to me. Last year, he paid $7500 for the tear-off and new asphalt shingles. I was hoping I could get the nailbase done for a total of around $13k, but that's just speaking with my wallet and the practicality of my spending. There is no way for us to determine if the quote is reasonable. We don't know the size of the roof; how many feet off the ground it is; whether the roof has good access for ladders or difficult access; the clearance to adjacent houses; and whether there is room to set a dumpster or to stage materials and equipment. We don't even know the R-value of the nailbase. If you don't like the estimate, call up a few more roofing contractors and get a few more estimates. I have a small uninsulated concrete block home in Clearwater, Florida. (Added stucco and elastomeric paint to exterior, would have added rigid foam if I knew then what I know now.) There also is no insulation in the wall between the attached garage and the house. Now the simple gable roof needs replacing. I can see it buckling in a couple small areas and there has been leaking, which has been fixed. AC handler and ducting are in the attic and probably leaky. Also, I'd like to use the attic for storage and possibly cathedralize the living room (which is the center of the rectangle). I read your other article, "Creating a Conditioned Attic-Five questions to consider before insulating a sloped roof" and this. I have seriously thought about using SIPs. Innova Eco is in Miami, not too far, and their roof SIPs are 10", with EPS and MgO panel on top side. They spray a coating on top of that. I have requested a quote. However, it sounds like your rigid foam concept might be preferable. If this were your house, what would you do? Is there a specific formulation that would be preferable in Zone 2 hot-humid-rainy? EDIT: I was thinking about removing the sheathing, at least in the small damaged areas, but I just saw the photo of the installation over existing roof. Would this work? Thank you for your always-excellent articles. Q. "If this were your house, what would you do?" A. If I could afford to do the work, I would install roof insulation that meets minimum code requirements. In your climate zone (Zone 2), that means R-38. Since your air handler and ductwork are in your attic, this insulation should be installed above your roof sheathing, so that you create an unvented conditioned attic. In other words, you should follow the advice given in the article posted on this page. You shouldn't do any of this work without first exposing enough of your roof sheathing to make sure that the sheathing and rafters are sound. Repair as necessary before proceeding. If you can't afford the work -- welcome to the club. Do the best you can with the money you have. Good luck. Q. "For such an unconditioned house, would one or two inches of above-deck insulation help somewhat reduce the transfer of the tropical sun's heat into the living area?" A. Yes, although you can't expect to be cool and dry when the windows are open all day, and the weather is hot and humid. Your expectations need to be low enough to be satisfied with the approach you have chosen. If the humidity is beginning to get to you, you should install window glass and an air conditioner. Q. "If so, should we resort to XPS?" A. To insulate above your roof sheathing, the usual approach is rigid foam. However, XPS is the least environmentally friendly option (because it is manufactured with a blowing agent with a high global warming potential). Either EPS or polyiso would be more environmentally friendly. Q. "Does this look approach to the above-deck insulation look functional?" A. Yes, your stack-up will work. Q. "Can we get away without venting in the above-deck roof, given our unconditioned house?" A. There is no need to vent the roof you describe (especially in a hot, humid climate, where venting is counterproductive). Q. 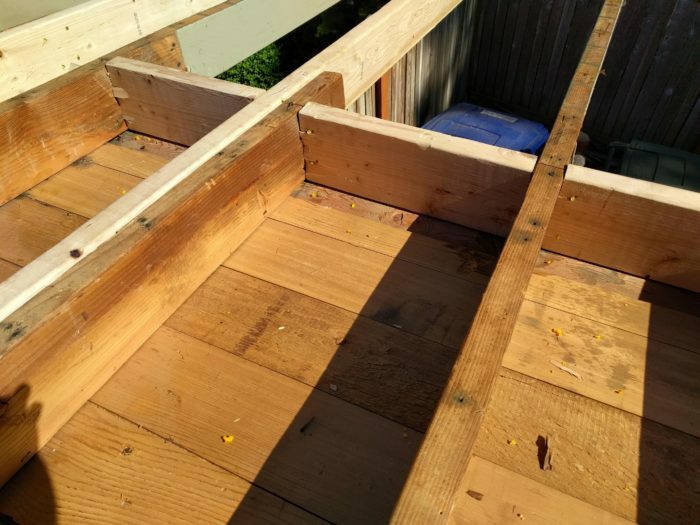 "I don't know how the roofers will be able to attach the standing seam once the roof is built up in this way--the screws must somehow artfully pass through the above layers to stop within the old 1.5" brushed cedar T&G deck without being visible from below in the open beam ceilings." A. First of all, a little bit of math should help with roofers choose a good screw length. (I think that 2 3/4 inch screws would work fine.) That said, I think that standing-seam roofs are routinely fastened to 1/2 inch plywood, without being attached to rafters or roof framing. Talk to your roofer. Q. "I've read in a couple of places that "whirlybird" attic fans (we're about to install a solar one to cool our attic) can cause attic wood rot--is this a concern under our unconditioned scenario?" A. In a hot, humid climate, you definitely don't want to install a powered attic ventilator. For more information on this topic, see Fans in the Attic: Do They Help or Do They Hurt? Aloha--relieved to just find this site, and impressed with the level of expertise in evidence here! I've not yet found a treatment of our particular simple unconditioned building scenario--forgive if I missed it. Excellent article, and dialogue, here. I've not yet been able to find building science addressing above-deck insulation for such an open house. What we just tore off was the original pitch and gravel and two layers of modified bitumen; what we'll lay down is aluminum standing seam. Here's what I (know I) don't know. Q1: For such an unconditioned house, would one or two inches of above-deck insulation help somewhat reduce the transfer of the tropical sun's heat into the living area? Q3: Can we get away without venting in the above-deck roof, given our unconditioned house? Q5: I've read in a couple of places that "whirlybird" attic fans (we're about to install a solar one to cool our attic) can cause attic wood rot--is this a concern under our unconditioned scenario? Mahalo Nui in advance for your help as we take this path to a "permanent" and cooler roof! Thank you again very much for your help! May I ask what you think might be the relative effectiveness at slowing heat transfer using a radiant barrier (TechShield) board under aluminum standing seam as follows (instead of ~1.5" of polyiso), on a year-round unconditioned, unsealed house in hot/wet climate? A radiant barrier won't be effective if you sandwich it between roofing underlayment and Ice & Water Shield. The radiant barrier only works if it faces an air space. ...then you would get a benefit from the radiant barrier. According to ASHRAE Fundamentals, a 3/4-inch-thick air space bounded by such a radiant barrier will have an R-value (resistance to downward heat flow) of between R-2.1 and R-2.3. That is less effective than 1.5 inch of polyiso, which has an R-value of about R-8. So the polyiso wins. Note that the zinc plated aluminum SRI is only 72, due to the ultra- low 0.08 emittance. The white (probably titanium oxide) finishes from that vendor are comparable or better than the much shinier bare zinc. This is pretty typical. Mounting metal roofing on 2x purlins giving 1.5" of air between the roof and foil-faced polyiso gives you the thermal benefit of the radiant-barrier facer on the polyiso, as well as the full R-value of the polyiso. The exact R of the polyiso isn't constant with temperature and it falls off with rising temp, so it depends on just how hot that purlin-cavity gets. Any convective cooling you can get through that purlin gap is going to help, but it will vary with location on the roof, the greatest benefit being near where the convection air is entering. We have a vaulted ceiling in our old cabin-like home. it is a storey and a half. upstairs we have knee walls and a front porch overhang with no insulation. straight forward roof - moderate to highly sloped. we have the usual intrusions plus a wood stove chimney and 2 light tubes. We need a better roof as we currently have both ice damming with some water making its way inside and likely not enough insulation. The vaulted ceiling profile from the interior to the exterior has the following layers: drywall, vapour barrier, extended rafters with 5.5" of Roxul (R22? ), rafter-mate baffles, original T&G roof deck, roofing paper/felt, shingles. I am interested in adding insulation to the roof. EPS overtop the existing shingles & 2x4's for air channels, 1x3 strapping across the channels for a vented cold metal roof overtop the added foam. 1. Are the rafter-mates problematic? If so, would their effect be negated if I filled the gap with spray foam from above the deck down into the void? I would need to drill access holes down through the shingles and decking - what distance between holes would be needed? 3. Should the porch overhang be insulated from underneath? (has a t&g Ceiling). 4. What happens at the peak? Currently there is a ridge vent - does it just get ripped off? along with careful mating of rooftop foam to follow? 5. We live in Sudbury, ON. What zone are we in?? Answers here can help me wrap my around around the best course of action moving forward and will help determine whether there is work to be done on top of the existing roof or both beneath and on top of the existing roof. Many thanks! Great and helpful articles on this subject that I wish existed but 16 years ago. Time to get it done right. Thank you in advance for providing your expertise here! I am building a 4/12 roof in Zone 3 (Charlotte area North Carolina). I'm planning on open cell spray foam on the underside of the roof deck. I am curious as to whether the first layer of OSB could be omitted if the foam board did not react to the spray foam? And considering my climatic zone, what would be the optimal roof and wall construction method? If you want to install rigid foam above your roof sheathing in Climate Zone 3, then 1/2 inch of rigid foam board is not "ideal." This rigid foam layer needs a minimum R-value of R-5, and that's impossible with 1/2 inch of foam. As my article states, you need a minimum of about 1.5 inch of EPS, 1 inch of XPS, or 1 inch of polyiso. In your question, there's another issue: the difference between a minimum standard and an ideal roof. It's hard to design the ideal roof, but in general, thicker rigid foam is better than thinner rigid foam. When building a sandwich as you propose -- OSB, rigid foam, and OSB -- you can't omit the lower layer of OSB, because roof sheathing is structural. It has to be fastened directly to your roof trusses or rafters to obtain the strength that engineers insist on. Fire considerations of air gap under shingled roof deck? what happens in the case of a fire? Seems to me that fire would spread rapidly through such a roof (much quicker than though a roof that had mineral wool in direct contact with the underside of the topmost roof decking). Is there a less flammable roof decking material/stack up that you'd recommend? I'm in Zone 4 Coastal. This type of roof (a vented roof) meets building codes and the expectations of the insurance industry. It's possible that unvented insulated roof assemblies are somewhat safer in a fire than conventional vented roof assemblies -- but if that's true, I've never seen any data that shows that it's true. Perhaps some researchers have studied the issue and published a paper reporting on their findings -- but if they have, I haven't seen it. In the absence of data, I hesitate to speculate. Q. "Is there a less flammable roof decking material/stack up that you'd recommend?" A. I wouldn't recommend it (because of the high expense), but you could adopt commercial construction techniques if you wanted to. It's possible to use steel framing and to install steel decking (or concrete decking) if you want. You can even install steel roofing on top of your steel or concrete decking. The firefighters I know talk about that, when flames enter the soffit vents and set the decking on fire, it's game over in a hurry. Thinking of doing a "chainsaw retrofit" which (unfortunately) would connect the rainscreen gap on the walls to the roof's ventilation channel. I can reduce the flame spread up the rainscreen gap by using mineral wool exterior insulation and fiber-cement siding (leaving the wooden furring strips as the only flammable item on the exterior walls) but wasn't sure how to do a similar risk reduction on the roof ventilation channel. Is there a non-flammable sheathing material for roof decking that's suitable for attaching shingles to? (Thinking something like DensGlass)? It sounds like you are talking about a small subset of structure fires -- namely structure fires that are caused by wildfires. These are buildings that burn down after being ignited by burning vegetation near the house. Structure fires caused by wildfires probably represent a small percentage of structure fires in the U.S. -- (and I welcome statistics on this issue from knowledgeable GBA readers). The percentage of structure fires caused by wildfires ranges widely by location. Here in New England, this type of fire represents something close to 0% of all structure fires. In dry areas of California, the percentage is of course higher. Rigid insulation under a Cool Roof in Zone 3? Appreciate this extremely helpful blog. I live in Charleston, SC, in an old (1858) 3-story wooden house. Plan to replace asphalt shingle roof with standing seam metal. Currently there is no insulation anywhere, and the third floor, basically an enclosed attic, gets crushed by heat in the summer. Proposed project: strip off the asphalt shingles, apply 1" polyiso and then "cool roof" metal over that. Would then add cellulose in rafters, and on top of of the third floor ceiling (the third floor ceiling is low, leaving an A-frame of unfinished and partially vented attic above it). My question is whether the polyiso is worth it if we are going with a very reflective/emissive metal roof, if heat gain on the third floor is the big energy issue. Q. "My question is whether the polyiso is worth it." A. If you are planning an unvented insulated roof assembly -- one in which the insulation follows the roof slope -- the polyiso is not only "worth it," it is required. The polyiso performs an essential function: it keeps the roof sheathing above the dew point during the winter, preventing moisture accumulation in the sheathing. If, instead, you are considering a vented roof assembly, then the polyiso would be unnecessary. Thank you! Wondering if this is not an "insulated roof assembly" -- cellulose would go on top of the conditioned third floor living space's ceiling, which is a good four feet below the rafters that will support the new metal roof. The space above the ceiling could be thought of as uninsulated attic; if so, would answer be the same? Charleston SC is very warm and humid. If you have a vented unconditioned attic, then installing polyiso above your roof sheathing is a waste of polyiso. If you want to install a thicker layer of insulation, then all of the insulation belongs together -- in your case, on the attic floor. Take the money that you would have spent on the polyiso and use it for a thicker layer of cellulose. Of course, I hope you don't have any ducts up there. Installing ducts in an unconditioned attic is always a mistake. Thanks! Last followup I promise: house was built in 1858 -- attic space above the third floor ceiling is not intentionally "vented" (so gable vent, no soffit vents) but it is leaky, w gable ends constructed out of lapped siding with no sheathing. Also, to complicate things, because the third floor living space is mostly an enclosed attic, the third floor walls follow the roofline. So while it has a flat ceiling (creating an 5 ft wide by 4 ft tall A-frame "attic" above it), the 4 ft of sloped walls follow the roof line, then terminate into a knee wall. I could *probably* get cellulose in the rafters between the sloped wall and roofline. Did I mention there are five dormers? Nothing easy with this house. My concern from the thread was having cellulose in those rafters without insulation above roof decking. Then again it is very warm here so maybe water concerns are lessened. We get about 20 freezing nights a year total. If you have a section of your sloped roof assembly that is insulated (or needs to be insulated), then of course you have to follow the usual rules for these types of insulated assemblies. You still have the usual choices: you can create a vented insulated roof assembly or an unvented insulated roof assembly. If the assembly is an unvented insulated assembly, it would need at least some rigid foam on the exterior side of the roof sheathing in your climate zone. For information on installing rigid foam above roof sheathing, read the article on this page (the page where you posted this question). If you have further questions, you may want to post them on GBA's Q&A page. You wrote, "Before installing the rigid foam, make sure that the roof sheathing is airtight (or that you install an air barrier immediately above the roof sheathing)." Is it acceptable to use a layer of taped foil-faced polyiso foam immediately above untaped sheathing as the air barrier? There are two schools of thought on this question. 1. Joe Lstiburek's take is that you need an air barrier at the sheathing level, or else you risk the possibility that warm interior air will get into the cracks between the rigid foam panels, creating convective loops that melt the frost on your roof in stripes. It happened to Joe, so he now insists on a tight air barrier at the sheathing level. 2. 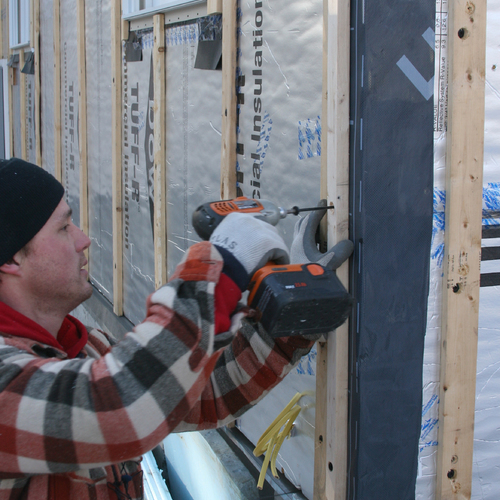 Other builders say that taped rigid foam can be the air barrier, especially if you have at least two layers of rigid foam with staggered seams (to prevent those embarrassing frost-melt stripes). If you go this route, it's best to tape each layer of rigid foam. I had in mind that plain vanilla osb with polyiso taped with inexpensive foil tape was more cost-effective than either trying to tape untreated OSB with Siga or using Zip panels and tape. But if two layers of polyiso and taping are needed, that defeats some of the cost benefit. Zip system and EPS is probably more effective since there is no ambiguity in the air barrier (it's all at the sheathing layer) as long as you don't mind the frustration of fastening many inches of EPS to the roof. Great article. Thanks for in detailed reviews on this topic. I am currently planning to reroof my flat roof home here in Albuquerque, NM. My roof construction is as follows (interior to exterior): gypsum board, polyethylene, R-29 fiberglass batts in 2x12 joists, half-inch plywood decking, and finally a tar and gravel roof. There is no dead airspace between the fiberglass and the plywood decking. This setup may be similar to that of the Arizona houses that Bill Rose investigated. The roof is currently un-vented. At this point I plan to do a complete tear-off of the existing roof in order to inspect the plywood. Then the new roof will consist of tapered (1/4” over 1 ft pitch) polyiso foam, 75 lb. paper followed by 3 layers of 15 lb fiberglass paper with hot mopped tar in between each layer, and then gravel. Strips of modified bitamen will be applied to the parapet walls. The question is whether or not we should install roof vents. The roofer is talking about installing one-way vents will “let the hot air out.” Should this roof be vented in this way? 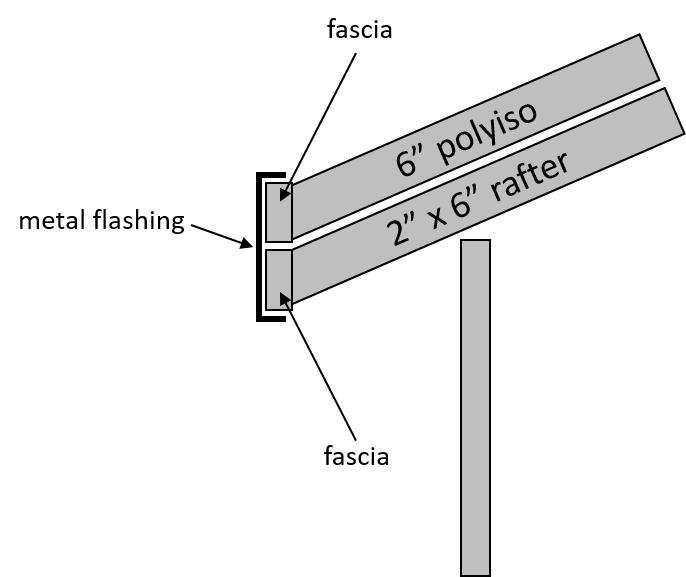 A separate issue is the thickness of the polyiso foam. The minimum thickness of the foam will be 0.5”. If I understand your articles correctly, for my climate zone (4B), I am required by code to insulate the roof deck with R-15 so that condensate does not form on the plywood. However, to increase the minimum thickness of the polyiso foam to 2” would put parts of the roof above the parapet wall, and not to mention greatly increase the cost of this project. Q. "The question is whether or not we should install roof vents. The roofer is talking about installing one-way vents will 'let the hot air out.' Should this roof be vented in this way?" No. If you are installing rigid foam above the roof sheathing, you certainly don't want to ventilate under the roof sheathing. Your roofer is wrong. Q. "The minimum thickness of the foam will be 0.5 inch. If I understand your articles correctly, for my climate zone (4B), I am required by code to insulate the roof deck with R-15 so that condensate does not form on the plywood. However, to increase the minimum thickness of the polyiso foam to 2 inches would put parts of the roof above the parapet wall, and not to mention greatly increase the cost of this project." A. If you are using polyiso, 2.5 inches of polyiso would be the minimum thickness for your climate zone. Where the roof extends above the parapet, simply trim the exposed edges with metal flashing. Parapets are useless (and in fact often inhibit the proper installation of insulation and also often inhibit proper drainage). Here is a link to an article with more information on the type of roof you are describing: Insulating Low-Slope Residential Roofs. I'd like to attach 5V metal roofing to battens laid atop 10" of EPS, which would be on top of the OSB sheathing. My concern is, for V5, structurally, I don't think that I can just lay the battens atop the EPS. 10" tall battens also seems like a bad idea. To add more complication, I was thinking about encasing the EPS in 2" of closed cell foam to serve as the vapor barrier and the last bit of required insulation. What's the best way to approach this? Will battens laid atop the Closed cell foam and bolted to the sheathing with 10" lag screws with rubber washers be sufficient? Would that compromise the vapr barrier? Ten inches is a lot of foam, so it's time for you to consult an engineer. The SIP manufacturer can provide advice on fastening -- they have in-house engineers. * I want to confirm that the roof underlayment goes *beneath* the foam in this scenario. * Do I need to worry about the purlins having any moisture problems, or (as I assume from the article) is that a non-issue? * Do I need to run sheathing over the top of the applied rafter tails to give the polyiso a continuous surface to rest on? I would love to avoid the extra weight (since I'm building a tiny house on a trailer), but I also don't want the polyiso to end up getting crushed into the rafter tails if we step on that area of the roof, so I'm assuming it's best to have sheathing there to distribute the weight. * I will be attaching our fascia boards to the applied rafter tails, and I've ordered our roof drip edge long enough to extend from the top of the roof, down over the polyiso, and over the top of the fascia boards. To protect the edges of the polyiso from moisture, I am planning to run Grace Ice & Water around the edges of the polyiso and down to overlap the fascia boards, similar to the detail for the "Thick Roof" drawing shown on this article. Does that sound reasonable? Thanks again for all your excellent advice! I don't know what I'd do without this website. Q. "Can you please confirm that I've got the stackup right?" A. You haven't given us enough information for an answer. In order to provide an answer, we need to know (a) your climate zone; (b) the thickness of the mineral wool insulation; and (c) the thickness of the polyiso. Q. "I want to confirm that the roof underlayment goes beneath the foam in this scenario." A. Roofing underlayment is required by most roofing manufacturers and building codes, and these manufacturers and most code enforcement officers would probably recommend that the roofing underlayment be installed above the polyiso. You don't need roofing underlayment above the taped Zip sheathing, because taped Zip sheathing is waterproof. However, if you want to install asphalt felt between the Zip sheathing and the polyiso, the asphalt felt will do no harm. Q. "Do I need to worry about the purlins having any moisture problems, or (as I assume from the article) is that a non-issue?" A. Your purlins will be fine, until the day your roofing starts leaking. Q. "I have opted for applied overhangs, per the details in this article: https://www.greenbuildingadvisor.com/blogs/dept/musings/getting-insulatio.... Their drawing does not show the use of exterior foam on the roof, though." A. Look again. The PERSIST approach shown in that article includes rigid foam above the roof sheathing. 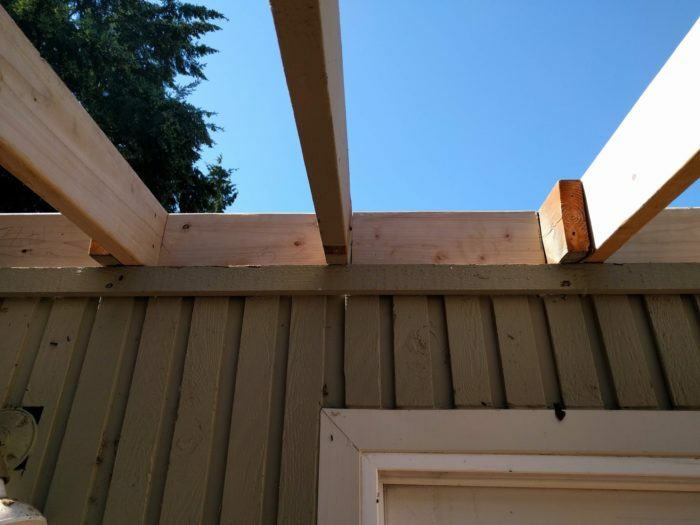 Then 2x4s (usually installed on the flat) are installed above the rigid foam; these 2x4s are extended at the eaves and rakes to create a roof overhang. Q. "Do I need to run sheathing over the top of the applied rafter tails to give the polyiso a continuous surface to rest on?" A. You don't need polyiso on the roof overhangs. Q. "I will be attaching our fascia boards to the applied rafter tails, and I've ordered our roof drip edge long enough to extend from the top of the roof, down over the polyiso, and over the top of the fascia boards. To protect the edges of the polyiso from moisture, I am planning to run Grace Ice & Water around the edges of the polyiso and down to overlap the fascia boards, similar to the detail for the "Thick Roof" drawing shown on this article. Does that sound reasonable?" A. I don't think so. In most cases, a PERSIST roof has no rigid foam on the applied overhangs. See the detail drawing below. Q. "What type of roof underlayment between the roof deck and first layer of polyiso is necessary with the taped OSB seams and foil facing of the staggered foam panels?" A. If the OSB seams are taped with a high-quality tape, and you are also taping the rigid foam seams, you have good air barriers. Strictly speaking, you don't need roofing underlayment on the lowest level of OSB -- but because the work on the roof might take a while (during the construction phase), some ordinary asphalt felt might be a good idea to help keep the OSB dry. Q. "I can't figure out what type of tape is used for the OSB joints. Is it one of the aluminum tapes?" The attached file shows a roof detail for an ICF house planned for Omaha, Nebraska. You'll see that the top chord of the 30" roof trusses rests on the ICF wall. Between the trusses and sill pieces, I intended to use sill sealer and spray foam to keep the joint between the top of the wall and roof deck airtight. I've tried to follow the guidance across multiple articles and, not counting the nominal R-value of the non-foam layers, estimate the insulation above the roof deck to approach R-55, but, in any event, exceed the R-49 required. f. 3/4" T&G OSB with seams taped. 1) What type of roof underlayment between the roof deck and first layer of polyiso is necessary with the taped OSB seams and foil facing of the staggered foam panels? 2) I can't figure out what type of tape is used for the OSB joints. Is it one of the aluminum tapes? Many thanks for this valuable resource. Perfect! Really appreciate it, Martin. This greatly helped me avoid some bad/more expensive ideas from contractor and architect. We are renovating a mid-1800's carriage house in mid-coast Maine (zone 6). The building was completely gutted prior to purchase and the exposed beams and roof structure sold us on the place. What we didn't factor in was the difficulties and expense of insulating the unvented hipped roof with two skylights on opposing sides of the "peak". We decided it would be worth covering up the exposed roof decking and rafters to insulate at a reasonable cost. Not as reasonable as we had hoped. Three quotes all came in over $10k, so we're now considering insulating exclusively with rigid foam above even though the roof is still in fairly good condition. If this option proves expensive at least we'll save by not having to finish the interior ceiling and we get to keep the feature that sold us on the building in the first place. I'm not getting comparable information from roofers so turned to this site for some knowledge. All fully understood that I planned to keep the ceiling exposed and only insulate from above. The first roofer wouldn't touch the job, it just isn't in his wheelhouse. The second (a fairly sizable company) thinks 6"+ inches of foam is too much and came back with a recommendation of using a 3.5" of polyiso nailbase panel faced on one side with MDF, followed by asphalt shingles which they said this would give us R20 on the roof, no mention of ventilation. When I balked at R20 and repeated there would be no insulation on the interior, they responded with R20 is pretty good considering it has nothing now. (FYI, the town I live in only follows state code for plumbing and electric so no one is going to insist I get to R49.) Roofer #3 has no problem stacking up 6"+ of foam on the roof, but insisted he would only do the job if he installs prefabricated metal roof vents in every other rafter bay. I had a hard time grasping that one and his explanation didn't do much to help my understanding. My questions – First, can you tell me if the 3rd roofers insistence on vents in every other rafter bay is appropriate for this situation? And if so, can you explain how all my heated interior air in the winter won't just escape through those vents? In regards to this article and my situation, assuming Option 1, all insulation above the roof sheathing, and being able to skimp a little on R value and code, would installing less than R49 above (but hopefully more than R20) cause any issues and if so what sort? I'm a little confused regarding the section on ventilation channels. 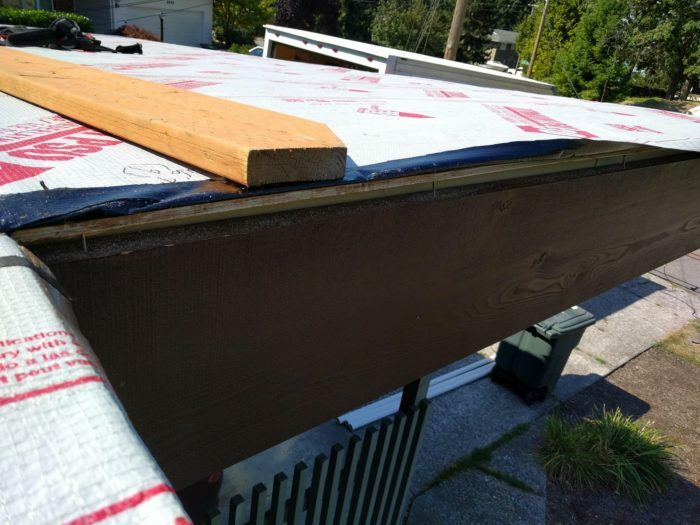 Does an air gap, in and of itself, between the foam and the upper layer of sheathing make a difference or must there be a path for air to travel from soffit to ridge and if so, is there some way to create this above what is currently an unvented hipped roof? Basically, does this paragraph apply with a hip roof? Thank you so much for this column and the opportunity to learn. Kim, I'm sorry you are having so much trouble finding someone do do this. You could certainly survive with R20, but there's no good reason to stop with that little. But then the suggestion of venting every other rafter by is very hard to make sense of. The only things I can think of that he might mean are either putting some venting above the foam between it and the new roofing, which is a good idea. Or maybe he think you are going to put drywall over the rafters, and have uninsulated closed cavities there, and he wants them vented to the indoors. There might be builders who are generalists and do some roofing who understand insulation better than the roofers you are talking to. You could also try talking to EcoCor, which is a very innovative green building company at least somewhat near you. They have a system of cellulose insulated wall and roof panels that are primarily for new construction, but they also do retrofits, and might be able to offer something good for your situation. And if they can't, they might know a builder to refer you to. 1. You can tell the roofer who likes nailbase that "Nailbase is available in a variety of thicknesses from several manufacturers. For example, ABT Foam sells 9-inch-thick nailbase panels rated at R-33, while Atlas EPS sells 11¾-inch-thick nailbase panels rated at R-48." 2. You can point out to the roofer who wants to install ventilation channels underneath the roof insulation that ventilation channels always belong on the exterior side of the insulation, not on the interior side of the insulation. After all, why would you want to introduce cold exterior air into a channel on the interior side of the insulation? Martin, I certainly agree that beefing up on the R20 is good, should I assume from your response that being shy of R49 with no added interior insulation will not cause problems? Nice to know my reasoning is sound on the through the ceiling vents. If I can convince him to vent above the insulation, can that be a simple air gap or must it be vented for air flow from soffit to ridge? And is that feasible with my hip roof? Charlie, thanks for the lead. I'll seek them out for another opinion and quote. The roofer who suggested the vents is a general builder who does a lot of roofs and he stood inside with me and agreed how cool it would be to keep the ceiling exposed. Maybe he had an off day. I'm planning a south side sunroom addition with a simple metal shed roof. I'm in rural southwest NM at 6300 ft - it will get up to 90 in the summer and down to the 20's in the winter (and some snow). I have limited height against the existing brick wall, so the slope will be about 1/12. I am buying 1x6 t&g blue pine (beetle kill) and want to expose between the rafters - as follows: rafters, t&g, underlayment, 2" foam (polyiso? ), 2x4 purlins, then metal roof. My concerns: 1) having enough ventilation to avoid overheating in the summer, 2) will 2" polyiso be enough and is polyiso the right choice, 3) does this make sense? Thanks for your great articles! So much to think about! Assuming that you don't have to meet any minimum code requirements for R-value -- and it sounds like you don't -- then you can install below-code insulation levels without worrying about moisture problems. If you end up with R-20 foam or R-24 foam instead of R-49 foam, your roof won't rot. You'll just have higher energy bills than a house with code-minimum insulation. 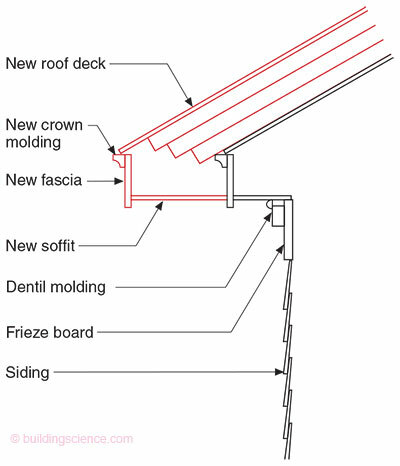 On a hip roof, there isn't much point in spend extra for ventilation channels above the rigid foam, since soffit-to-ridge venting is impossible on a hip roof. I urge you to read this article: How to Build an Insulated Cathedral Ceiling. It sounds like you are located in Climate Zone 4 or 5. In your climate zone, building codes require a minimum of R-49 roof insulation. You are planning to install only R-12 insulation; that's woefully inadequate. It's fine to use polyiso insulation if you want; but you'll need to install at least 9 inches of polyiso, not 2 inches of polyiso. I am assuming that this article almost exclusively applies to a conditioned and unvented attic, right? My attic, in a Zone 5 dry arid climate at 5000 feet, is currently passively vented and unconditioned. I favor installing air wash channels under the sheathing but I also want to reduce daytime temps. When the outside air is in the 90's or 100's the temps in the attic can reach 150. For this reason I am leaning towards some form of polyiso or a combination of polyiso and EPS on top of the sheathing. Am I going the wrong direction with this plan? There are two types of attics: vented unconditioned attics and unvented conditioned attics. You have to decide what type of attic you want. If you have a vented attic, it makes no sense to install rigid foam above the roof sheathing. A vented attic is basically outdoors -- so installing rigid foam above your roof sheathing is a waste of money and a waste of rigid foam. You might as well put the rigid foam in the branches of a tree in your back yard. If you want to install rigid foam above your roof sheathing, it means that you are committed to creating an unvented conditioned attic. For more information on this type of attic, see Creating a Conditioned Attic. If you don't have any HVAC equipment or ducts in your attic, it makes sense to have a vented unconditioned attic. This type of attic is less expensive to insulate, and it usually performs better in all respects than an unvented conditioned attic. If your attic has HVAC equipment or ducts, you may want to create an unvented conditioned attic. or do you just live with it and [over]compensate with a ton of insulation on the attic floor? As long as your attic doesn't contain any HVAC equipment or ducts, the temperature of your attic is irrelevant. The reason that building codes require R-38 or R-49 insulation on the attic floor is that analysis shows that this level of insulation is cost-effective. It's not only cost-effective -- it's enough insulation that you don't have to worry whether your attic temperature is 110°F or 150°F. In either case, the insulation is enough. That said, some GBA readers install R-60 attic insulation, and you're free to do that if you want. But putting insulation above the roof sheathing is misguided if you have a vented attic. Instead of adding insulation above your roof sheathing, put it on the attic floor where it belongs. If you intend to use your attic for storage, and if you are worried that the attic will get so hot that your wax candles (or whatever vulnerable items you are storing) will melt, that's another story. In that case, you probably want to design an unvented conditioned attic. Thanks for clearing that up and steering me in the right direction. This site is awesome made all the better by contributors like you. I’ve read many articles on GBA on this topic and really appreciate the dialog. I’ve learned a lot. I’m in climate zone 3 and am building a new home and am to the point where I need to make a decision on how to finish the roof structure. The roof is a 12/12 pitch. Simple gable style. I’ve got a cathedral ceiling throughout consisting of 2x12 TJIs running along a ridge beam. I’ve thrown out the idea of using spray foam on the underside of my sheating due to the fact it's too expensive. As I see it I have these two options and I’m interested in opinions. Option 1. Create a vent channel underneath the sheathing using cut and cobble method. foam battens created from 2” polyiso glued in place on the top cord of the TJI. That gives me 1.5” of ventilation space. 8 1/2” is left for fiberglass batts. high density R-30 batts are 8 1/4” high so that just fits. The rigid battens are R-10 so that gets me to where I need to be for code. I will have wiring and sprinklers in that ceiling. Option 2. Create an unvented roof putting foam on top of the sheathing. My roofing is steel and is designed to be mounted on battens/purlins. From what I’ve learned here, seal the seams of the OSB roof sheathing with zip system tape to create an air tight barrier. Put down roof felt. Put full sheets of 2” foam on top of the sheathing and felt tacked in place. I know two layers of 1” foam would be ideal but that’s more expensive per R. Finally, lay down 1x4s parallel to the ridge at 24” spacing and screw those through the foam, felt and sheathing into the rafters. Roofer mounts his roofing clips to the 1x4s and installed the roofing panels. The roof is vented at the ridge and soffit. Inside we have an unvented rafter bay we can fill with standard R30 batts. It would give me extra room for wiring and sprinkler plumbing. In looking at both options, it appears that they cost about the same in materials. There’s the same square footage of rigid foam required. Option 1 requires glue/caulk/tape to seal the rigid foam and Option 2 requires zip system and housewrap tape and 1x4s. For labor, it seems that option 2 would be faster given there’s no cut and cobble of rigid foam. Foam is going down in full sheets on the roof and 1x4s are getting tacked in after. My inspector seems to be ok with either option. I know the bonus is I get a thermal break with the insulation on the outside. It gets hot here during the Summers so I’m looking to keep a 130 degree metal roof from transferring heat into my loft. Either approach will work, so the decision is up to you. 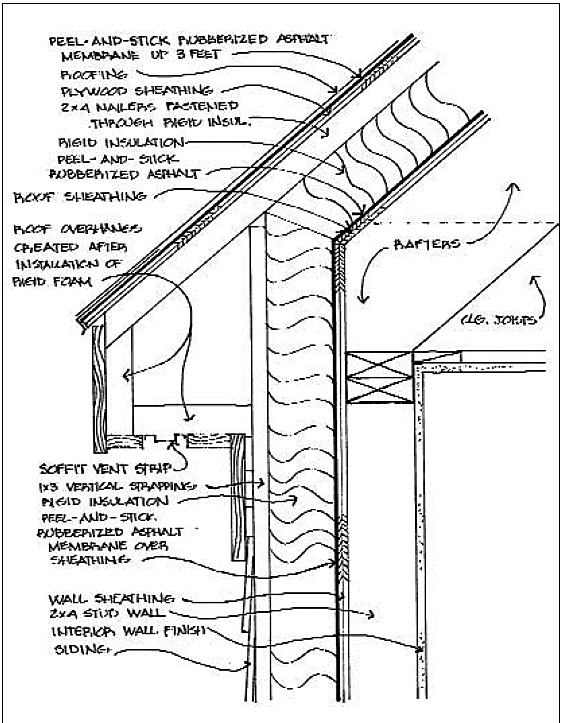 If your roof has a skylight or chimney, these features would argue against the vented option (since the features would interrupt the continuity of the ventilation channels). If you choose Option 2, it would be best if you could fill the entire rafter bays with fluffy insulation (fiberglass, cellulose, or mineral wool) rather than only filling a portion of the cavity depth. If your batts don't fill the full depth, you have two problems: (1) how to make sure that the batts stay in contact with the roof sheathing, and don't slump down, and (2) what material to use as an interior air barrier (which, ideally, needs to be installed in contact with the interior side of the fluffy insulation). I suppose that you could try to staple up strips of a European air barrier material on the interior side of the batts, but that's fussy work. It's much easier to let your drywall be the interior air barrier -- and if you decide to do that, you need to fill the full depth of the rafter bays with insulation. Thanks for your words of encouragement and advice. I really appreciate it. Understood on the need to keep fiberglass batts in contact with sheathing. One other thing came to mind. You mentioned in another article on GBA that venting the top side of sheathing with a cold roof (steel roof fastened on battens allowing air flow directly underneath the roofing but on top of the sheathing) while at the same time venting underneath the sheathing is incompatible. Why is that? I ask because of the intense sun we get here, even if I chose option 1, I like the idea of raising the roof off the sheathing 3/4" and letting some air flow underneath creating a "sombrero" of sorts. It seems like this would keep my roof cooler rather than having heat from the steel roofing get transferred directIy to the sheathing. Why is doing a cold roof a bad idea if I choose option 1? You must have misunderstood what I wrote. I probably wrote that if a roof has rigid foam above the roof sheathing, you don't want to have a ventilation channel underneath the roof sheathing (because it makes no sense to install insulation on the exterior side of a ventilation channel). If you want two ventilation channels -- one above the roof sheathing, and one below the roof sheathing -- that's perfectly OK, as long as all of the insulation is on the interior side of the ventilation channels. Thanks Martin. Makes sense now. I wanted to make sure that there isn't any significant problem with 2x4s being perpendicular to the rafters over the foam rather that parallel, as you recommended in the article for reducing ice dams? This would be to avoid adding additional 1x4 purlins or plywood over the 2x4s for attaching a metal roof. Also, if a channel is only open on one side, will it significantly increase risk of ice dams? Also, is there any structural concern about adding solar panels to a standing seam metal roof that is attached to 2x4s 24" o.c. rather than plywood base? no venting for hip roofs? In comment 67, you said not to put in ventilation channels with a hip roof. If no ventilation channels, how does one vent a hip roof? Thank you. Typically you build hipped roofs as un-vented assemblies. If you are using metal on the roof you can vent the hips the same way you vent a ridge. There are also some manufactured vents for hipped roofs with asphalt shingles, but I have no idea whether they work. It's possible (sort of) to vent a hipped roof over an unconditioned attic, with a combination of mushroom vents and (in some cases) a short ridge vent. If the house has cathedral ceilings, though, I don't recommend a vented approach for a hipped roof. 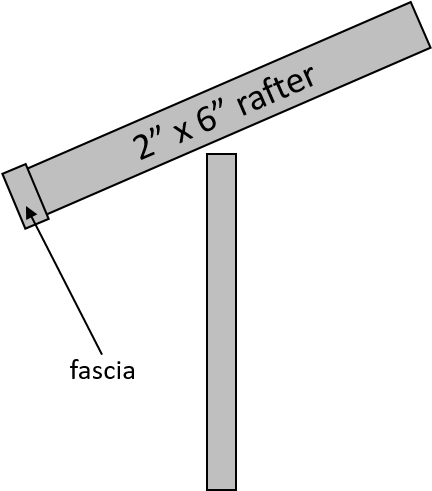 The only way you might succeed would be with two layers of strapping (probably 2x4 strapping) above the rafters -- one layer perpendicular to the rafters, and another layer parallel to the rafters). Each layer of strapping would be installed at either 16 inches o.c. or 24 inches o.c. You'd still need to be creative when it comes to installing vent outlets (again, probably a combination of mushroom vents and a short ridge vent). Also consider DCI SmartVents or similar. I have started a remodel of my home in Woodside, CA (I believe climate zone 3). The house has cathedral ceilings and is framed with 2x6". My plan is to use normal fiberglass between rafters (5.5") which will give me R-19, correct? And then add polyiso on top following your instructions above. Looks like 2 layers of 1" will give we another R-13 taking me to R-32 which is above the min R-30. But going for 2" (R-13) + 1" (R-6.5) poly-iso (Rmax Thermasheat 3) would get me to R-38.5 which I guess is a better idea? 1. You suggest air barrier for the first layer of plywood/OSB (on top of my 2x6") rafter and use "Siga wigluv tape" which sounds good but for the final layer of Rmax Thermaheet (where we also want it airtight) can I use HVAC foil tape (I assume cheaper)? 2. For the new insulation I place between the 2x6 should I use kraft faced fiberglass with the kraft paper down towards the inner ceiling? House has on the interior side drywall and then cedar planks and I am doing all the insulation from the top as I am also re-roofing. 3. If I use OSB board is there any value to add OSB Techshield radiant barrier version? I guess not since the 2 layers of OSB (On top of rafters and on top of polyiso) will both face an insulated area? Q. "My plan is to use normal fiberglass between rafters (5.5 inches) which will give me R-19, correct?" Q. "But going for 2 inches (R-13) + 1 inch (R-6.5) polyiso (Rmax Thermasheet 3) would get me to R-38.5, which I guess is a better idea?" Q. 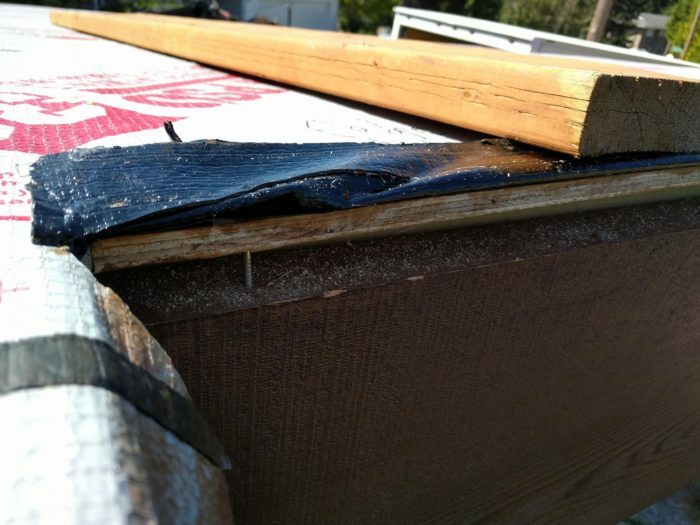 "You suggest air barrier for the first layer of plywood/OSB (on top of my 2x6) rafter and use "Siga Wigluv tape," which sounds good, but for the final layer of Rmax Thermaheet (where we also want it airtight) can I use HVAC foil tape (I assume cheaper)?" Q. "For the new insulation I place between the 2x6 should I use kraft-faced fiberglass with the kraft paper down towards the inner ceiling?" A. You could. Unfaced batts would also work. Q. "If I use OSB board is there any value to add OSB Techshield radiant barrier version? I guess not since the 2 layers of OSB (On top of rafters and on top of polyiso) will both face an insulated area?" A. You're right: the radiant barrier wouldn't help, because a radiant barrier is only effective if it faces an air space. We intend to install recessed lights (Airtight Title 24 approved cans) in the cathedral ceiling. Since we are using LED lights we can use shorter cans (Halo H25ICAT) that will fit between 5.5" joists for most of the areas but were we have the great room we have 20 feet ceiling and need deeper cans that can adjust for the roof slope and provide 1200 lumens (like Halo HL612ICAT). These cans are typically inside an internal metal box to handle the tilt function. With a depth of 7" they will go through the first plywood layer but I should still be able to cover them with 1 layer of 1" polyiso (R6) plus 1" square cut piece for the rectangular piece. I believe this is enough? For ceiling between the can and the plywood on top of the rafters can I use Siga wigluv or should it be sealed with some spray foam or silicon? Also If can fit it flush with 1" polyiso on top of the first plywood layer I can put the 2" on top? I guess there is no issue with putting first 1" polyiso and then 2" polyiso on top vs. start with 2" and then add 1"? First of all, I advise you to change your user profile so that your screen name isn't "N/A N/A." Here is a link to an article that explains what you need to do: How the GBA Site Displays Readers’ Names. Second: You are making a big mistake by installing recessed lights in your insulated ceiling. These lights (a) introduce air leaks even when carefully installed, (b) take up volume that should be devoted to insulation, thereby lowering the R-value of your assembly, and (c) create hot thermal chimneys that accelerate the stack effect and lead to hot spots on your roof. Q. "With a depth of 7 inches, the recessed lights will go through the first plywood layer but I should still be able to cover them with 1 layer of 1 inch polyiso (R6) plus 1 inch square cut piece for the rectangular piece. I believe this is enough?" A. It's not. You're wrong. The good news is that you have lots of options for other types of lights to install. Not only are there now low-profile LED lights that look the same as recessed lights, but in a high-ceiling room, you don't need them to be low profile anyway. Your comment is cryptic. I'm not sure if it's an observation or a question. If it's a question, here is the answer: If you are installing R-30 insulation in Zone 3 (following the method discussed in this article), at least 13% of the total R-value of the roof assembly must come from the rigid foam layer. That means that you'll need a minimum of R-3.9 of rigid foam (1 inch of EPS). For more information on this topic, see Combining Exterior Rigid Foam With Fluffy Insulation. I've just read every word of this article, almost every comment, and joined the website too... Great information here. I've got two complex issues that have me concerned and we have already hired the roofer and have product on the roof waiting to be installed. Scheduled work to start in two to three weeks, but I fear they will start sooner. General project, 'restore' and update a 1930's building purpose built for a newspaper, offices & printing plant, plus a 1970's addition. The 1930's building is a steel 'superstructure', wood truss building with brick walls and limestone façade. The 1970's addition is a steel building, steel decking with cinderblock walls. Roof 1> 1930's building, 2nd floor office space. Original roof (still intact) is hot tar over 7/8" tongue & groove deck. We believe according to a roof core that there is only one layer of torch down over the hot tar. At most two layers. Engineers have certified that we do not have to tare the existing roof off. Since the original plaster ceilings were not salvageable, we have exposed the roof trusses and wood roof deck. The intent is to leave them exposed along with the brick walls. There are some small intermittent leaks that appear during heavy rain, but not light rain. We are Zone 4, which I understand is R38. The roof is a flat roof. >Solar System with racking & ballast - Minimal screws into the OSB layer TBD. One other item of note is that because the interior tongue & groove ceiling is fully exposed, the contractor has agreed to align the screws from the OSB into the roof trusses so we don't have a ceiling riddled with screws. And in order to ensure enough pull out resistance, the screws have to land in the roof trusses, not just the wood deck. I don't believe that there is a vapor barrier in the current stackup. Is this a concern? I read comment #3 several times and I understand the concern, my question is, because we are basically exposed to the ceiling, how much should we worry about not having EPS on the top layer? (We are on the very northern edge of Zone 4, as in the next town is Zone 5). Again, the original roof is intact. The building was purpose built for a high speed web-offset press with huge ink drying ovens & motors generating heat, so the idea was to get the heat OUT of the building, not trap it inside. There is also a 10 foot x 30 foot skylight in the middle of the room, and the ceiling height is 18 feet. The skylight is single pane glass, a whole separate issue I'm sure! Existing building construction is a heavy gauge steel deck, fully exposed on the inside. There are NO screws holding the roof on. It is beautiful to look at and we are doing our best to keep it free from screws. Again, the structural engineer has determined we do not have to remove the existing roof. This space will be used as a residence, again with a fully exposed roof structure. >Densdeck 1/2" (or equal) Screwed into the 1/2 OSB. >Screws up into OSB. (new) Rather than screw down into the steel deck, the contractor has agreed to drill holes in the steel deck and screw up INTO the OSB so that we can have a fixed pattern of screw heads on the exposed ceiling so that it doesn't look like a warehouse with screws sticking out into the space. Concerns are many here. Because of the huge skylight and the structural setup, we can not add more than 2" of additional height to the roof or Durolast will not permit the design because the curb heights become too small. Also, the Steel deck is a commercial 'deep channel' heavy gauge deck. The channel 'pockets' are open air with only the 1-1/2" polyiso above it. With the low total R Value and these air-channels, I'm worried in the winter that the roof deck will be cold enough to literally condense moisture on the inside. Note, we have had the building for two years, but it has only been heated to 55° with a scorched air blower heater, to keep the sprinkler pipes from freezing, and we have NOT seen a problem, but the space was vacant and I assume ambient moisture levels were not high enough. We considered doing a tareoff but the consensus is that the Polyiso in place now is still effective and removing it won't allow us to increase the overall R value, so it was not worth removing it. Any thoughts or other advice? I hope I made it as clear as possible! If you're interested, we started a facebook page to collect the history of the building and there are many photos showing it over the years, two of them show the 1970's roof as it overhangs the car park. It was built for the Peekskill Evening Star newspaper. I hope my post isn't too long winded for you! Q. "I don't believe that there is a vapor barrier in the current stackup. Is this a concern?" A. The old hot tar (asphalt roof) is a vapor barrier. Relax. That said, you need an excellent air barrier at the bottom of this stack-up. If any exploratory holes have been drilled in the old roofing, or there are obvious seams or air leaks, these need to be carefully repaired and sealed before the first layer of polyiso goes down. Alternatively, the first layer of polyiso needs taped seams. Even better: tape the seams of the OSB layer in the middle of the sandwich. Use a high-quality tape like Siga Wigluv. Q. "I read comment #3 several times and I understand the concern, my question is, because we are basically exposed to the ceiling, how much should we worry about not having EPS on the top layer? (We are on the very northern edge of Zone 4, as in the next town is Zone 5)." A. Well, your 8 inches of polyiso will have an R-value that is at least R-40, and probably more. I wouldn't worry. Q. "I'm worried in the winter that the roof deck will be cold enough to literally condense moisture on the inside." A. For the roof with steel decking that has deep channels, the two biggest areas of concern are: (1) The interior perimeter of the roof, where the ceiling meets the wall -- you need to seal the air leaks where the steel channels meet the wall. (2) The exterior perimeter of the roof, there the steel channels may be covered by flashing that allows air penetration to the steel channels between the decking and the lowermost layer of rigid insulation. These channel openings need to be exposed and sealed with spray foam. I'm not as familiar with commercial roofs as I am with residential roofs. If I were you, I would hire a consultant from Building Science Corp. in Westford, Mass. The consulting fee will be worth every penny you spend. They are experts at air leaks and corrugated steel decks like the one you describe. Thank you for the quick answers and help. I will reach out to the company you recommended. We have had a real hard time getting good advice in all areas of the building. From recommendations to spray foam historic brickwork (HUGE NO NO!) to putting vents in the historic limestone façade! HVAC requirements has also been a big problem for mix-ed use, conversion of a purpose built historic structure. I hope you had a chance to see the photos on facebook, we are very excited to bring this building back to life. How long has this insulation system been used? I live in the San Francisco Bay Area in the east bay which is climate zone 3. I'm planning an addition and remodel. The roof structure will be 2x8 rafter and I have 2" I can add on top of the sheathing due to zoning height constraints. I'd like to install r30 mineral wool battsbetween the rafters and 1.5" of polyiso above the sheathing. My architect is unfamiliar with this and thinks closed cell spray foam between the rafters is a more proven approach. How long has this sandwich insulation approach been used? I'd rather use it but am concerned if it doesn't have a long track record. I am building an unvented roof in Marine 4 zone and following your excellent article above, including JL,s suggestion to put an impermeable peel n stick on the bottom layer of roof sheeting which I just completed. My quandary is I am putting down plywood above 7 inches of EPS for my SS metal roof and elswhere on GBA there has been a variety of opinion on whether a permeable membrane would have the ability to breathe out through metal. I am using a snap lock panel tha does have a few slightly raised flanges. Mr. RIversong suggests breathable in all cases, which was my original thought given the bottom impermeable layer. Most of the new synthetics are very low perms .06 or so unless I go to a polyolefin or similar breathable such as GAF deck armour....but these seem to be geared towards shingles. Both these high and low perm synthetics all indicate they pass the D4869 water shower test in Canada so I assume they stop some water penetration equally. HOwever am unsure which way to go as if the metal prevents any realistic breathability I am wondering if the impermeablemembranes would be better protection for the plywood as they may prevent trapped moisture between the metal and the membrane from coming back through the membrane into the deck.... thanks in advance. There is no outward drying through a standing-seam metal roofing. 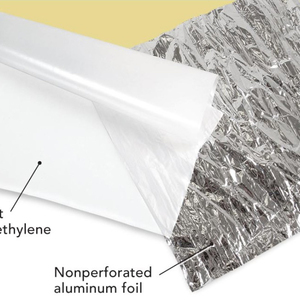 The metal roofing is a vapor barrier. If you build an unvented roof assembly -- a common approach -- the vapor permeance of the roofing underlayment is irrelevant. If you want ventilation channels between the top of the insulation layer and the underside of the upper layer of plywood roof sheathing -- an unnecessary step in most cases, but useful in some climates to reduce the chance of ice dams (a problem that does not generally affect standing-seam roofs) -- the usual method would be to create a ventilation channel by installing 2x4s on the flat, 16 inches or 24 inches on center, from soffit to ridge (in other words, the 2x4s are perpendicular to the ridge). These 2x4s are installed above the top layer of rigid foam, and are fastened to the rafters below with long screws. The result is a ventilation channel that is 1 1/2 inch deep. The top layer of plywood is fastened to the 2x4s. What about snow loading for these type of assemblies? I'm working on a plan for a mountain lodge that gets drifts up to about 15 feet deep on the roof (and has seen 25 feet deep, though at that point it get shoveled). Does the foam hold up? The rigid foam will hold up just fine. As I'm sure you know, though, you'll need to talk to an engineer about sizing the rafters or trusses. Thank you for the informative article and comments. I have a few additional clarificating questions for my situation. Climate zone 4 Marine. I have a low-slope roof (1:12 on one half, 2:12 on the other) with torchdown, which I am replacing with standing seam metal. The house has vaulted ceilings throughout, with 2x6 rafters, currently filled with 55-year old rockwool insulation (~R-11, definitely well below code). The ceilings are vaulted throughout, which means the insulation is sitting directly on the ceilings, with ventilation space between the insulation and the sheathing. Water leaks and likely condensation from poor insulation have led to some sheathing and rafter damage, which I plan to replace as needed. Current plan is to only replace sheathing where damaged, convert to an unvented roof, and then add 6 inches of polyiso. This implies that I would simply keep the existing rockwool resting on the ceiling. Reason for keeping the rockwool is because I don't want to take down inside ceiling (cedar T&G) and don't want to remove the good sheathing just to remove the old rockwool. Q1: The article states that if some insulation is above sheathing (foam board) and some insulation is below (something breathable), then the insulation underneath should be attached directly to the roof sheathing. Will there be an issue if I keep the existing batts in place, resting on the ceiling instead of attached to the sheathing? Q2: Between the sheathing and the first layer of polyiso, do I need any type of barrier, such as ice/water shield, or can the polyiso go directly on the sheathing? First of all, can you tell us your name? (I'm Martin.) It makes this type of online dialogue a lot easier. 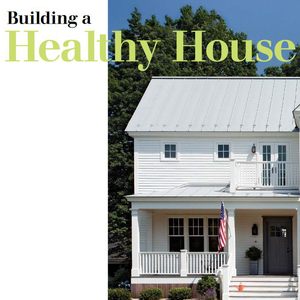 Second, you probably should read this article: "Insulating Low-Slope Residential Roofs." Third, are you sure that the manufacturer of your standing-seam metal roofing allows its roofing to be installed on a roof with a 1-in-12 pitch? Q. "The article states that if some insulation is above sheathing (foam board) and some insulation is below (something breathable), then the insulation underneath should be attached directly to the roof sheathing. Will there be an issue if I keep the existing batts in place, resting on the ceiling instead of attached to the sheathing?" Q. "Between the sheathing and the first layer of polyiso, do I need any type of barrier, such as ice/water shield, or can the polyiso go directly on the sheathing?" • If your roof has board sheathing, install an airtight membrane (for example, Solitex Mento, a product available from 475 High Performance Building Supply), a layer of synthetic roofing underlayment, or a peel-and-stick membrane. • If your roof has OSB or plywood sheathing, the panel seams can be taped (for example, with Zip System tape or Siga Wigluv tape); after taping the panel seams, install the roofing underlayment of your choice (for example, asphalt felt)." Q. "Right now, 2x8 cedar fascia (needs replacement) cover the rafter tails (2x8 fascia is also on the gable ends). I still need the same coverage the fascia is providing today but with the added 6" of polyiso, need to cover that as well. Any ideas on how to cover everything in a way that looks good? I've never seen 2x14 fascia, but maybe I'm not looking hard enough :)." A. You can use metal flashing (coil stock), which comes in a variety of colors. Or you can get creative (see image below). Thanks, Martin. I'll go back and read again for those details I missed. Regarding the metal roof, yes, manufacturer allows installation on 1:12. Thanks for checking. Regarding the fascia, for your coil stock idea, would that be a single large piece that covers both fascia boards, which would be stacked one on top of the other? Currently, the rafters extend a few feet past the wall; the fascia basically cover the tails. Added drawings to illustrate current and potential solutions. Reading your article "How to Build an Insulated Cathedral Ceiling", I want to clarify that my understanding is correct. I believe the article is saying that the assembly should not have a vapor barrier; however, there should be a form of air barrier, but not necessarily in the assembly itself (e.g., gypsum board with tape). I'm pretty sure the builders committed the "biggest air-barrier blunder" in that my T&G was not attached to taped gypsum drywall. At best, they might have first put up some thin plywood and attached the T&G to that. If I find there is no air barrier, is there any way for me to add an air barrier without pulling down the T&G and adding drywall? I will have access to the top of the T&G when I remove the sheathing, but I'm not sure if there's a legitimate way to add an air barrier between the rafters. If you decide to use coil stock as the fascia, it would be a good idea to form it as a drip-edge for the metal roofing. Be really careful how you detail the lower edge of your metal roof panels. At 1/12 the water will want to move back into the roof on the underside of the metal (by friction and capillary action), rather than falling into the gutter or off onto the ground. You might also think of using one piece of lumber for your fascia. From your drawing it's unclear what the upper-one would be fastened to. Thanks, Malcolm. Good point about fastening the top fascia; it probably won't fasten very well to polyiso! For a single piece fascia, will it hold well enough if only the lower half of the board is attached (to the rafters)? Also, thanks for your advice on the drip edge. Sure. The top is nailed to the plywood roof sheathing too isn't it? I'm sorry that I didn't see your Comments #102 and #103 when you posted them. Q. "Regarding the fascia, for your coil stock idea, would that be a single large piece that covers both fascia boards, which would be stacked one on top of the other?" A. Yes, a single piece of coil stock, with appropriate drip-edge details as mentioned by Malcolm. And you need a single fascia -- 3/4-inch plywood will work if you can't find solid lumber. Q. "Reading your article "How to Build an Insulated Cathedral Ceiling", I want to clarify that my understanding is correct. I believe the article is saying that the assembly should not have a vapor barrier; however, there should be a form of air barrier, but not necessarily in the assembly itself (e.g., gypsum board with tape). I'm pretty sure the builders committed the 'biggest air-barrier blunder' in that my T&G was not attached to taped gypsum drywall. At best, they might have first put up some thin plywood and attached the T&G to that. If I find there is no air barrier, is there any way for me to add an air barrier without pulling down the T&G and adding drywall? I will have access to the top of the T&G when I remove the sheathing." A. Correct: No need for an interior vapor barrier, but you will need an interior air barrier. Working from above, you can install 1 inch of closed-cell spray foam on the top side of the T&G boards as an air barrier. If the gaps between boards are large, or there are knot-holes, you'll need to put down rectangles of cardboard or some type of membrane first, to avoid spray foam bulges squeezing between the cracks. That said, it may be easier to establish the air barrier at the sheathing level -- either by taping the plywood or OSB seams (if you have that type of sheathing), or by installing a peel-and-stick material like Grace Ice & Water Shield above the sheathing as an air barrier. Malcolm, I wasn't aware that the fascia connected to the sheathing. I'll check with my contractor. Underneath the plywood sheathing, the assembly will be fully sealed to create an unvented assembly (with either no insulation or the existing rockwool simply resting on the ceiling). Currently not planning on including 2x4 above the polyiso due to my being in climate zone 4C. Please let me know if there's anything wrong with my plan above, and thanks for all your help. Your plan sounds fine to me. I don't think that the asphalt felt layer is necessary, unless it is intended to protect the lower level of plywood during construction (in case of rain). Construction is underway! I've attached pictures of my rafter bays (2x6), which will be filled completely with mineral wool batts, and then of course I'll a layer of sheathing and then 6" of polyiso on top of that. My question for you relates to the vertical foam board, shown in the picture to be between the rafter ways. Using the pictures I attached as reference, if I don't include any polyiso, will I get condensation on the pressure blocks and gable-end trusses? If so, should I put the polyiso against the pressure blocks and gable-end trusses on the interior or exterior? Please try not to cringe when you see the T&G nailed directly to truss without an air barrier! My understanding is that this is an existing house with a board ceiling, and that the original builder forgot to install an air barrier above the ceiling boards. Is that correct? If so, the most important task for you to work on is air sealing the perimeter of these 2x6 rafter bays. The polyiso you propose isn't important. What you need to do is stop air leaks -- with lots of caulk or canned spray foam. Correct. This is 1962 construction with T&G nailed directly to trusses and no air barrier. As I turn this into an unvented assembly, I plan to use lots of caulk and spray foam to make it airtight around the perimeter. My air barrier will be achieved with ice and water shield above the first layer of sheathing. I also have 3M flashing tape available. Not sure if the tape or the I/W shield is preferred, or if it doesn't really matter. Above you stated that polyiso on the exterior of the 2x6 blocks is not important. For my learning, could you help me understand why this polyiso is not important. More specifically, if I were to exclude the polyiso above the sheathing, I would get condensation on the sheathing due to the sheathing surface reaching the dew point. What is preventing the same thing from happening to the sides of the 2x6 blocks if I don't include some foam insulation vertically on the outside of the 2x6 blocks? Is there something about the blocks being vertical that makes condensation less of an issue than it would be for sheathing? You guessed correctly: the rules for vertical surfaces (let's call them "walls") are different than the rules for sloped or horizontal surfaces (let's call them "roofs"). Roof sheathing is at much greater risk of moisture accumulation, due to two factors that don't apply as strongly to walls as to roofs: 1. The stack effect (which carries moist interior air upward) and night sky radiation (which cools roof sheathing below the outdoor air temperature in some weather conditions). All of that said, it's perfectly OK to install polyiso against the blocking if you want to. I'd probably do it myself, even though it isn't strictly necessary (as long as you do a good job of air sealing). Exactly what I needed to know. Thanks again! The installation is complete, including IW shield and fascia. Next step is to put down the standing seam metal roof. Overall, I'm extremely pleased with the insulating performance of the assembly. One issue I'm facing is that when installing a section of the fascia, the contractor got the angle cut slightly off. This caused a gap to open up between the top CDX and the fascia, eventually reaching a size of 1.25". The contractor was able to subsequently close the gap over another sloped run. Luckily, the creation and removal of the gap both happened on slopes of the gable side, and so visually, you can't really notice. On the other hand, once I put soffits up, I think it will be more noticable from underneath, but in reality, I'm probably one of the few people in the world that will notice. I'm not sure there will be any performance issues since the gap will be covered by a metal drip edge. Regardless, I'm going to always know it's there (and it will bug me), and since I paid a lot for this contractor to do the work, I've asked them to pull off the fascia (~25') and reattach it. I'm getting significant push back from the contractor: they are saying it's not an issue, and that I should just fill with spray foam spray foam. This isn't an easy fix because it's massive massive 2'x14' cedar fascia, already attached with SS ring shank nails (risk of damaging the boards if we pull them). But, this was clearly a miss on their end that the should have caught as they were installing them and fixed immediately. Am I being too finicky and making this into a bigger issue than it is? If this crack will be covered by your dripedge flashing, you are being too fussy. I'm not sure of your construction details. Are the fascia and the roof sheathing both part of your air barrier? (That would be unusual.) If the fascia and the roof sheathing are both part of your air barrier, then the use of canned spray foam to seal this gap sounds OK to me (although not ideal -- not as good as planning a different detail for your air barrier). Neither the fascia nor the top layer of roof sheathing are part of the air barrier. The air barrier is the lower layer of IW shield that is on the lower layer of CDX, directly underneath the polyiso. Sounds like I am being way too fussy. I'll simply fill with Great Stuff Pro Gaps & Cracks foam. I don't need the foam for air barrier reasons; the void just bothers me. Please let me know if I you have any further advice, and thanks again for your prompt reply and helpful advice. -Home located in climate zone 3, southern California. -2x6 rafters spaced @ 24"
One section of roofing has an attic underneath. This attic space does has soffit venting but doesn't appear to connect to the ridge vent, nor does it have a gable vent. Another small section of roofing has a tiny attic underneath. This attic space is not accessible, but has a gable vent and a whirly bird. -Does the above plan seem reasonable given the information? -Do I need to close off the existing soffit vents in the rafters? If so, what is the recommended way to do this? -Are 8+" screws sufficient to hold this much foam and roof sheathing in place, particularly on a such a high pitch roof? -What material goes at the side edges of the roof to contain the foam? I recently discovered your comment here, and felt a little guilty for not answering -- and than I remembered that you posted it again on our Q&A page ("Vaulted ceiling insulation advice?"). So it looks like you got the advice you needed. I have a home (zone 4 marine) with "vented" cathedral ceilings, I believe there are R-28 fiberglass bats in-between 2x12 rafters. There is a soffit vent and a ridge vent on two sections of the roof with lower slope 6/12. There is no soffit vent on the 12/12 portion of our roof as only the gable ends have soffits, there is a ridge vent. We are having a standing seam metal roof installed. I am planning on installing 2" of xps ridge foam or Gutex Multitherm 60 (R-8.7) on the exterior of the sheathing, then a vapor perm WRB, then furring strips at 45 degrees to attach the metal roof to and allow for drainage of any condensation. The interior of the ceiling is sheetrock, then an air gap, then 2x T&G. There is no air barrier in the stack other then the sheetrock and plywood or OSB sheathing. My question is, since the roof is "vented" although poorly, and the bats are likely not in direct contact with the sheathing, will I have any issues with the exterior foam and condensation on the interior of the sheathing? Also should I seal the soffit vents or ridge vents? We would really like to upgrade the R-value of the roof, but want it to last a long time. We have a limited budget. Any advice is appreciated. If you go this route, you'll have to spend a lot of time conscientiously sealing up the air intake openings and air outlets for each ventilation channel -- whether at the soffit vents or at the ridge vent. You need an airtight assembly -- and if this roof assembly used to be vented, that can be tricky. We would like to use this method on our 59 year old home as a retrofit. We live near Chicago, Illinois. I have not been able to find any contractor in our area who has used this method before. Please help me get in touch with a contractor from any area who has successfully used this method and would be willing to do the job for us or help us make sure we do the job correctly. Thanks. I suggest you read this article: "I Can’t Find a Contractor to Do That." We have a mostly seasonal NH cabin (use wood stove occasionally in cold season... for an occasional winter break to the cabin) that we are going apply 4 inches of rigid foam on top of the otherwise uninsulated cathedral roof. The roof is ten years old asphalt shingles. Can we save time and apply the rigid foam on top of the shingles? Also, I recently (before reading all the issues with polyethylene) insulated the 2x4 cabin walls with fiberglass insulation, applied plastic to the warm side, and then ship lapped the interior. We use the lake cabin mostly in the summer (much less in October thru April). Because we use limited ac and heat, I am hoping polyethylene issues won't present. My second question relates to when I apply cedar shakes to the existing painted exterior ship lap siding. I don't want to limit breathing but feel I should use a housewrap. How does Ben Obdyke hydro gap sound (seems expensive ....) for my application? Q. "The roof is ten years old asphalt shingles. 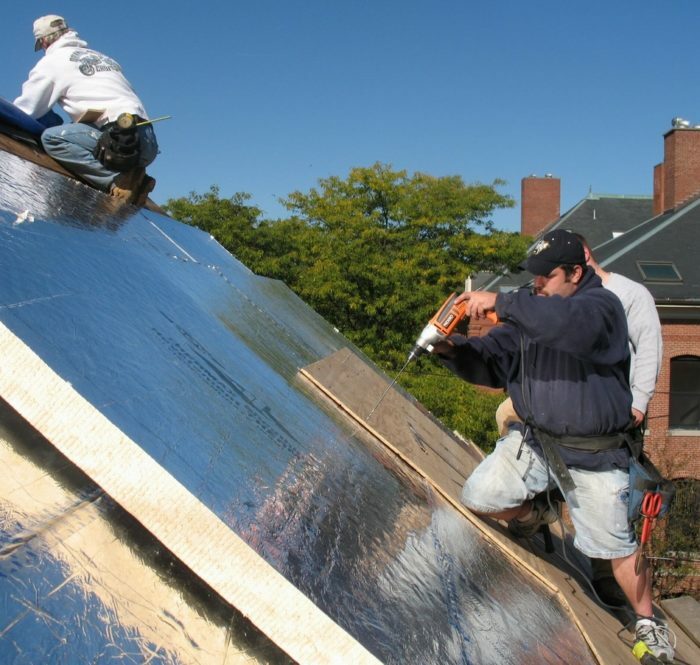 Can we save time and apply the rigid foam on top of the shingles?" A. You can, but I wouldn't. Stripping shingles is fast -- use a flat-bottomed spade. Clean up all the nails. Then you can (a) inspect the sheathing, making repairs if necessary, and (b) use air sealing tape at the seams, or install a proper air barrier (a peel-and-stick product or a European air sealing membrane). Q. "I applied plastic to the warm side, and then shiplapped the interior. We use the lake cabin mostly in the summer (much less in October thru April). Because we use limited AC and heat, I am hoping polyethylene issues won't present." A. Everything should be OK, but polyethylene makes a lousy air barrier -- easy to rip, and too many holes -- and your shiplap boards leak air like a sieve. Your method won't get you into trouble, but it isn't airtight, so other GBA readers shouldn't imitate your approach (especially if they care about energy costs). Q. "When I apply cedar shakes to the existing painted exterior shiplap siding. I don't want to limit breathing, but feel I should use a housewrap. How does Benjamin Obdyke HydroGap sound (seems expensive ....) for my application?" A. A water-resistive barrier (WRB) -- usually housewrap -- is a code requirement and recommended by everybody. It is not optional. Benjamin Obdyke HydroGap is a good choice under cedar shingles. 2. If we just skip the ventilation gap and install the second layer of plywood roof sheathing directly to the top surface of the EPS rigid foam, are we risking getting a lot of ice damming? Are there some other drawbacks we should be aware of? We don't think white asphalt shingles would look right, and so if we don't ventilate we will probably lose our shingles warranty. 3. If we skip the ventilation gap, would this be called a "hot roof"? I don't want to call off the project, but we may have to if the risks associated with not having a ventilation gap are too great. I am very grateful to be able to ask you for advice. Q. "Is it impossible to vent the west part of the Northeast Roof because of the way the Addition Roof ties in to it?" A. It looks impossible to me, since the bottoms of the rafter bays all begin in valleys. Q. "If we just skip the ventilation gap and install the second layer of plywood roof sheathing directly to the top surface of the EPS rigid foam, are we risking getting a lot of ice damming?" A. No. If your rigid foam is thick enough (and yours will be), the thick foam will reduce the chance of ice damming by 90% or 95%, even without any ventilation channel above the foam. Q. "If we skip the ventilation gap, would this be called a 'hot roof'?" A. Some people use that term, but I don't like the term "hot roof." The technically accurate way to refer to it is as an "unvented roof assembly." Properly designed, you'll end up with a cold roof -- whether vented or unvented. Are there any articles on techniques that explain how to guide a long screw into 2 inch wide rafter through thick foam? or does anybody have techniques that they have used? It seems like it would be really difficult to do. I feel like I would miss it each time. Yes, there is such an article. Here is the link: "A Timber-Frame House for a Cold Climate — Part 3." In the article, author Rob Myers explains how he created a jig to help make sure that his screw holes were established at a 90 degree angle to the roof plane. The simple answer to your question (in my opinion) is that 50% of all human beings are born with the ability to understand "plumb" and "90 degrees," while the other 50% of human beings just don't seem to have an intuitive grasp of "plumb" or "90 degrees." If you are struggling with this issue, I'll give you the same answer as the traditional response to the question, "How do I get to Carnegie Hall?" -- namely, "Practice, practice, practice." If you can cut a fresh loaf of bread into consistent slices, you might be one of those lucky people born with an intuitive understanding of "plumb" and "90 degrees." My husband and I met with our contractors yesterday and everyone decided not to add 8" of foam above our roof sheathing as I had hoped for because it would be costly AND it would cause such a thick fascia that it might decrease the value of our home, since it wouldn't blend in with the rest of the house. 1. He said he could add 3.5 - 4" of polyiso rigid foam above the roof sheathing and that would be sufficient - no need for also putting fluffy insulation between the rafters - I guess maybe our city doesn't require R49 since it is a retrofit - and the fascia, while being thicker, would look fine because it would not be all that noticeably different from the rest of the house. This would be the more costly of the two options. 2. He could put zero rigid foam above the roof sheathing and just put fiberglass between the 2x6 rafters. He recommended this option because it costs less. I said, "Wouldn't we would have to furr down the rafters to reach a high enough R value, and so wouldn't this option cause us to lose headroom?" He said no, we wouldn't lose any headroom. My goals are storage in our attic, preferably without losing any headroom; a tight building envelope with sufficient insulation; and the prevention of ice dams. 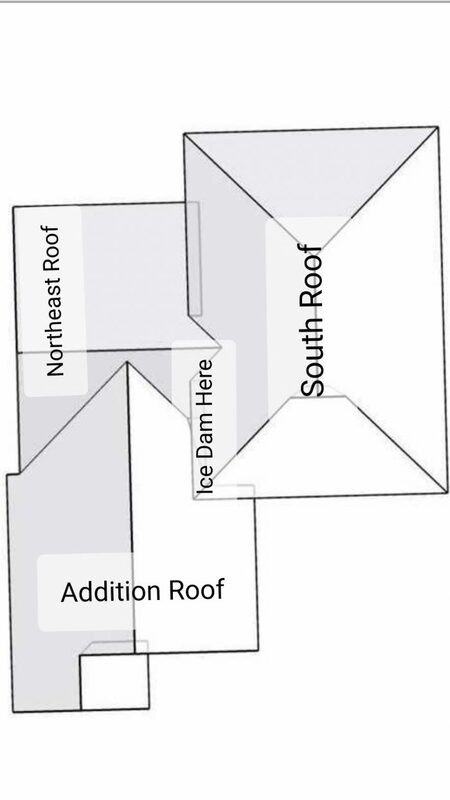 Ever since our addition ~8 years ago, we have been getting ice dams every year at the location shown in the attached diagram. Our house is always cold in winter, hot in summer, and has drafts and frequently fluctuating temperatures. My husband would like to choose option 2 w/ no rigid foam above sheathing, just fiberglass between rafters, because it would cost less. I am concerned that this would be a big mistake. ***Could you give me and my husband a rundown of the pros and cons of options 1 & 2? ***The roofing foreman said that he would vent the roof. (I couldn't understand his words exactly, but I think he would use the 2x4's on the flat as described in this article - I plan to check on that.) You at GBA had told me before that it looks like it might be impossible where the "Northeast Roof" attaches to the "Addition Roof". He felt confident that he could have one of his little guys get in there, and they could install vents. The roofing foreman did not seem interested at all in installing a "hot roof". He definitely wants to vent the roof, and I like the idea of venting the roof if it's possible. Should I be concerned that you thought it was likely impossible but he thinks it's possible? ***What is the best & least expensive way to seal around the perimeter of the attic? My contractor says to stuff fiberglass insulation batts around the edges - would this be fine? Thank you for helping us. This method is extremely unusual in our area, and so advice is hard to find. Q. "My husband would like to choose option 2 (with no rigid foam above sheathing, just fiberglass between rafters), because it would cost less. I am concerned that this would be a big mistake. Could you give me and my husband a rundown of the pros and cons of options 1 & 2?" A. The option with rigid foam is clearly better. Going with fiberglass insulation only is risky unless your air intake openings and ridge vent openings are robust in every single rafter bay. Q. "Would 2 inches of polyiso topped with 2 inches of EPS be our best option?" A. That option is fine, but any combination of polyiso and/or EPS would work. Q. "We would use reclaimed foam. How critical is it that the EPS be Type II?" Q. "The builder felt confident that he could have one of his little guys get in there, and they could install vents." A. I don't understand this plan. In the absence more more information, I'm skeptical. Q. "What is the best & least expensive way to seal around the perimeter of the attic? My contractor says to stuff fiberglass insulation batts around the edges - would this be fine?" A. No. Fiberglasss batts are not an air barrier. To seal air leaks, you need caulk, tape, or sheets of rigid foam with air-sealed edges, depending on the side of the opening -- or you can use canned spray foam (or two-component spray foam). Q. "Our neighbors had carpenter ants, and we might have them. 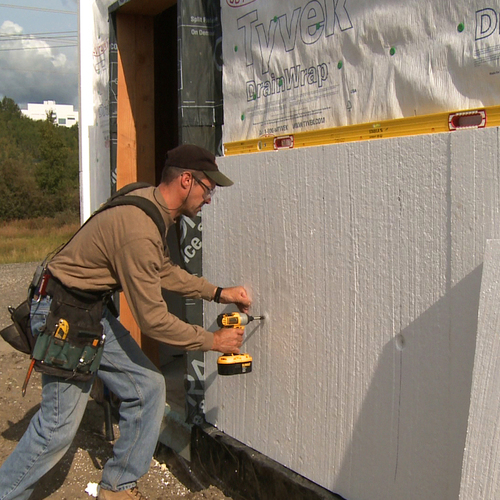 Does this make it really risky to install the rigid foam above the sheathing?" A. In my mind, no -- as long as everything is detailed well. Most experts say that carpenter ants follow the moisture -- so that if everything stays dry, your roof assembly should be ant-free. One more question - If I can't find 2" EPS, (and/or if doing two layers would cost a lot more in labor), would a single layer of 4" polyiso be just as fine? Four inches of polyiso will work. Just assume that the polyiso will perform at about R-5 per inch. I took some time to carefully study through many articles on GBA and your answers to other questions of mine over the years and have found answers to most of my own questions. I'm hoping our roofer is willing to install at least 2" of EPS over at least 2" of polyiso on top of the roof sheathing before the new shingles go on. If you get a chance, any advice on the best & least expensive ways to seal around the perimeter of the attic would be very helpful. See my comment above (Comment #135). For more information, see "Air Sealing an Attic." Hoping for help - fear I'm stuck. In Zone 6 in Toronto, years ago had my cathedral ceiling closed-cell spray-foamed and made a hot roof, hoping it would be enough to make it comfortable but didn't fur inward as there's no space to do so. R-27 later and it's not enough for comfort. I was thinking of adding rigid exterior but your guidance says no, not if you have closed-cell. If I stack rigid on the exterior when I go to re-shingle, I'll get condensation. I can't picture and could not find any guidance of an assembly that works (R-49+) and is safe in the long-run if you have closed-cell foam existing. Of note: 12/12 roof. Any ideas that work here from the experts? Appreciate it! If you are planning from the start to install rigid foam above your roof sheathing, it makes sense to leave vapor-permeable layers on the interior (to allow any moisture that may get into your roof assembly to dry inward). But your situation is different -- you've already chosen to install closed-cell spray foam against the underside of your roof sheathing. You wrote, "If I stack rigid [foam] on the exterior when I go to re-shingle, I'll get condensation." Says who? Not me. Where is the cold surface where condensation will accumulate? What are you worried about? If you now have asphalt shingle roofing, it's not as if your roof sheathing can dry to the exterior in any case. It can't. So adding rigid foam won't make the existing situation worse -- it will make it better, by warming up the roof sheathing. Thank-you, Martin! Glad I clarified my incorrect interpretation. This guidance below on what is recommended or not, is what threw me off. Appreciate the clarity and will proceed then. Thanks again. "If you follow Option 2, a wide variety of insulation materials can be installed under the roof sheathing. Among the possibilities: fiberglass batts, mineral wool, cellulose, or open-cell spray foam. 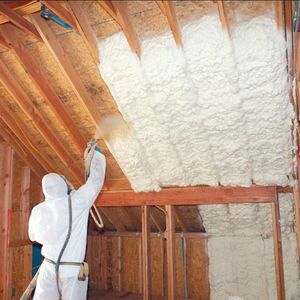 (Closed-cell spray foam is not recommended for this purpose, since closed-cell spray foam prevents the roof sheathing from drying toward the interior if it ever gets damp. " As I said in Comment #139, I stand by the advice given in the article. If you are creating a roof assembly with exterior rigid foam on a new house, it's better to use open-cell spray foam, not closed-cell spray foam, between the rafters. Your case is different, because you have already installed the closed-cell spray foam. I'm not sure why you concluded that this type of insulation will lead to condensation; I certainly never wrote that. In any case, it sounds like your incorrect interpretation has been clarified. My wife and I bought our first house last year in July. It is located in NH climate zone 6. At that time we did not know much about houses. Our house has maybe 60% cathedral ceilings and 40% where there is an attic you can go up into that is over a couple bedrooms and a bathroom. The house was built by somebody who built it themselves (aka not a typical contractor) and never lived in it. Within our price range we figured we would go with this house as it was not as dated as some of the other houses that were in our price range. We thought this would be better but we were wrong... Over the winter we had really high heating bills and by the time February came we had severe ice dams. These ice dams caused significant water damage requiring the removal of drywall and wet insulation in the ceilings and exterior walls. What we learned is the builder put blocking at the eaves between the rafter bays completely blocking any soffit to ridge ventilation. We also found that there is R30 fiberglass insulation in the rafter bays of the cathedral ceiling. After spending a lot of time on GBA I believe the best approach is to put exterior foam on the roof sheathing as we are looking to replace the shingles this summer due to the damage that was caused to the shingles to remove the ice dams and the fact that the builder never applied any ice/water guard. 3) Add r31 of foam to roof to create the correct inside to outside ratio of insulation as currently there are faced r30 fiberglass batts on the interior of the rafter bays. 5) Then I would put sheathing on top of that and have the typical roof placed over that. 1) How does a wood stove pipe going through the roof function in this kind of set up? 3) I know that the fiberglass under the sheathing does not contact the sheathing on the underside, is that going to cause problems? The contractors in our area that I have talked to seam to think the exterior rigid foam idea is ridiculous. Most think it is better to just rip down all the drywall in the ceilings and spray closed cell spray foam to reach an r value of r49 which is code in this area. So finding a willing contractor has also been a barrier. Q. "How does a wood stove pipe going through the roof function in this kind of set up?" A. Hopefully, what you have going through is roof is not a stove pipe. If it is, that would be very dangerous. Probably, what you have is a metal chimney -- which is quite different from a stovepipe. At the roof penetration, you need to install a penetration kit from the metal chimney manufacturer, and you need to follow the manufacturer's installation instructions to ensure a safe installation. Q. "How do skylights work in this set up?" A. Each skylight needs proper flashing at the roof penetration; different skylight manufacturers make different flashing kits. You can either remove each skylight and reinstall it in a new (carefully flashed) curb, or you can buy new skylights. In either case, each skylight needs a carefully constructed well. The well needs to be air sealed and carefully insulated. Q. "I know that the fiberglass under the sheathing does not contact the sheathing on the underside. Is that going to cause problems?" A. That's not ideal (and is one reason you've had all those ice dams). 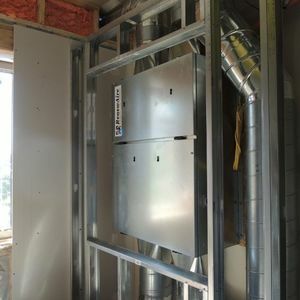 But once you install the new rigid foam, everything will be so much better that you shouldn't worry about the air gap. Just pay attention to air sealing at the ceiling plane. Thanks for the reply Martin, and yes it is a metal chimney I didn't realize there was different terminology. Martin, I am trying to figure out how to best insulate a small unvented roof above a bay window. Can mineral wool be substituted for rigid foam to insulate the exterior of a roof? Zone 5 project: replace rotting roof deck and shingles, add insulation above and below the roof deck to a non-vented roof above a bay window. Any thoughts/recommendations would be appreciated. You have the correct minimum R-value targets for your ratio. Here's the thing: installing mineral wool on the exterior side of roof sheathing is technically possible but rarely done. The hardest part of your plan will be finding semi-rigid panels of mineral wool that are dense enough to work. You can't just use batts. The type of dense mineral wool you need is hard to buy in small quantities. For more information on the different densities of mineral wool -- especially semi-rigid mineral wool panels -- see "Installing Mineral Wool Insulation Over Exterior Wall Sheathing." You'll find that it's much easier to buy rigid foam in small quantities than to buy dense semi-rigid panels of mineral wool in small quantities. I suggest that you install rigid foam with a minimum R-value of R-20 in this location, and use any handy type of fluffy insulation (fiberglass or mineral wool) between the rafters.